The day after a storm floods Vigàta, Inspector Montalbano encounters a strange, bedraggled woman who expresses interest in a certain yacht scheduled to dock that afternoon. Not long after she’s gone, the crew of the yacht reports having found a dinghy in the port, and within it, a disfigured corpse. Also at anchor is an eighty-five-foot luxury boat with a somewhat shady crew. Both boats will have to stay in Vigàta until the investigation is over—the unidentified man was poisoned, it seems. Based on the information—and misinformation—the mysterious woman shared with him, Montalbano begins to think the occupants of the yacht just might know a little more about the man’s death than they’re letting on. Inspector Salvo Montalbano, the life force of Andrea Camilleri’s droll police procedurals set on the southern coast of Sicily, lives so close to the sea that a bad storm can send waves under his front porch and a really bad storm can wash out the road into town. 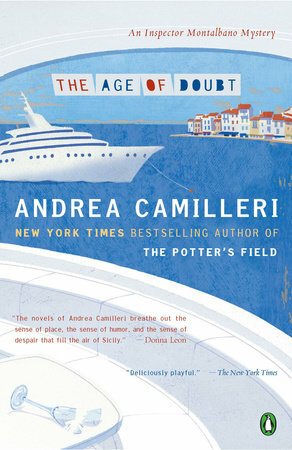 When that happens in ‘The Age of Doubt’ (Penguin, paper, $15), the chivalrous detective comes to the rescue of a young woman who has driven in from Palermo to meet her aunt’s yacht, the Vanna. But when the Vanna makes harbor, she’s towing a dinghy with a body in it, and when Montalbano questions the imperious grande dame who owns the yacht (in the breezy idiom of the translator, Stephen Sartarelli), he discovers that she doesn’t have a niece. Camilleri has his fun with the rich visitors who sail their huge pleasure craft into local waters but won’t dirty their Top-¬Siders by treading on local soil. But the more subtle and sustained humor in this series has to do with the sardonic attitude the Sicilians take toward strangers who view them as happy peasants, incapable of understanding their more worldly (and often criminal) pursuits. While Montalbano is smarter than the jaded villains give him credit for, he’s easily distracted by a fine meal, a beautiful woman, an interesting dream — or just the sight of the sea.